This game board is currently used as an upgrade Seafood Paradise 2 and will fit in the 6 or 8 player arcade machines currently available, operators simply need to adjust the number of players on the game board itself. This allows operators more variety from a single board. This Seafood Paradise 2 Plus game board comes with a main game board, IO board, small keyboard, communications cables, and a 12V/5A power adaptor. Increase in activation function: You can active the profitable scores by factory default setting using an activation code; same with marketing. 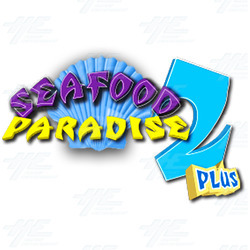 Seafood Paradise 2 Plus Game Board Kit will update your Seafood Paradise 2 machine to the latest in the English version series for new game play and increased profits. This fun and exciting game will draw in players from all across the floor. 19 different types of fish for players to try and catch - the bigger the catch, the more points you earn! Lucky Fish — When killing the lucky fish, player will get a x2~x3 Bonus reward for any kind of fish. Maximum reward is 150 time Bets! Convenient Operation - Auto Attack, Aim Attack makes the game operation more convenient and easy! You can hit any fish as you wish! Pikachu Chain Lightning - Creates a chain between many fish on the playfield and causing damage to a large number of fish. Heat Flames - creates a flaming snake-like burst which causes damage to all the fish it touches as it shoots across the shoal. Octopus Bomb - As the octopus' face goes red players can shoot it to cause an explosion. Rolling Thunder - hit the octopus to bring a rolling thunder bomb and killing all common species of fish on the screen. Frozen Stopwatch - will freeze all the fish within range and killing fish in this time can award double score. The Seafood Paradise 2 Plus Fish Arcade Machine is an original English version game with a number of thrilling features for players of all ages and skill levels to enjoy! The 2 Plus is an advanced version of the Seafood Paradise 2 game, created with many improvements aimed to increase owner profits, and out-performs many other versions, such as Chinese version fish games. This video showcases all the new game features! Features include 19 different types of fish to catch and many special weapons to catch them with! Special weapons include: Energy Cannon; Circular Power Grid; Invincible Cannonball; Lucky Fish; Convenient Operation; Pikachu Chain Lightning; Heat Flames; Octopus Bomb; and Rolling Thunder.